The water in the channel flowing out of Hezekiah’s Tunnel has been considered sacred and was believed to have healing powers. A church was built over the site by the empress Eudokia around 450 AD. This church, along with most other churches of the Byzantine Empire, was destroyed in 614 when the Persians invaded the Holy Land and Jerusalem. The remains of the bases of the pillars can be seen in the water of this open channel. The Pool of Siloam is just a few feet on the other side of the gate that is seen at the end of the channel. Until 2005, the channel was identified as the Pool of Siloam, but in 2005 the actual Pool of Siloam was uncovered accidentally by a city crew working on the public sewer system. Today this water flows on toward that pool. You descend by many steps to Siloam, and above Siloam is a hanging basilica beneath which the water of Siloam rises. Siloam has two basins constructed of marble, which are separated from each other by a screen. Men were in one and women in the other to gain a blessing. In these waters miracles take place, and lepers are cleansed. In front of the court is a large man-made pool and people are continually washing there; for at regular intervals the spring sends a great deal of water into the basins, which goes on down the valley of Gethsemane (which they also call Jehosaphat) as far as the River Jordan. […when] (the tunnel) was driven through. And this was the way in which it was cut through: While [ . . .] (were) still [ . . . ] axes, each man toward his fellow, and while there were still three cubits to be cut through, [there was heard] the voice of a man calling to his fellows, for there was an overlap in the rock on the right [and on the left]. And when the tunnel was driven through, the quarrymen hewed (the rock), each man toward his fellow, axe against axe; and the water flowed from the spring toward the reservoir for 1200 cubits, and the height of the rock above the heads of the quarrymen was 100 cubits. 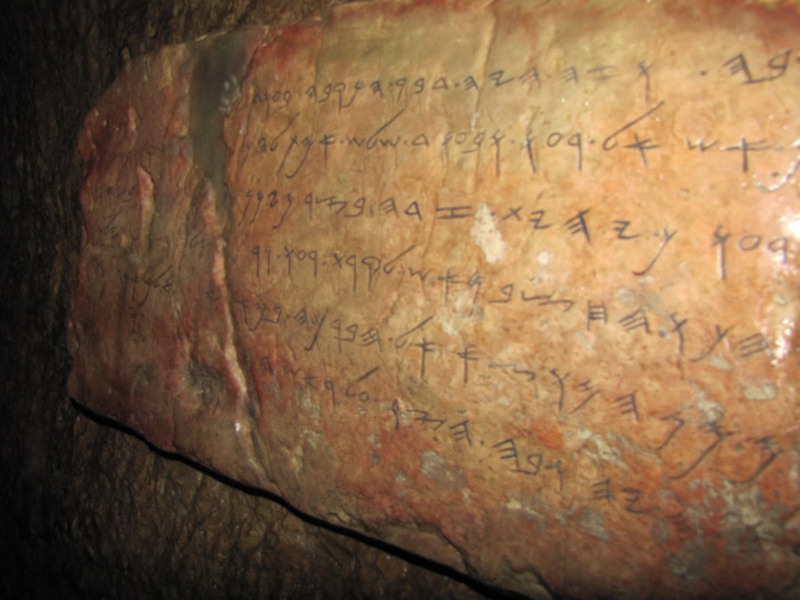 – Siloam Inscription, engraved in 701 BC. Hezekiah’s Tunnel was cut through bedrock in 701 BC under the City of David, curving and weaving for 1750 feet. If the same tunnel were cut in a straight line, it would be 40% shorter at only 1070 feet. This tunnel was designed and cut to bring water from the Gihon Springs in the Kidron Valley located on the east side of the Eastern Hill outside the city’s walls, through the bedrock of the Eastern Hill to the west side, where Hezekiah’s city of Jerusalem was expanding and protected by the new Broad Wall. This tunnel was discovered by Edward Robinson in 1838 and was cleared by Montague Parker’s team during the years 1909-1911. The water had continued flowing through this tunnel for 2,000 years. In fact, before its rediscovery, people thought the water in the area of the Pool of Siloam came from its own spring. 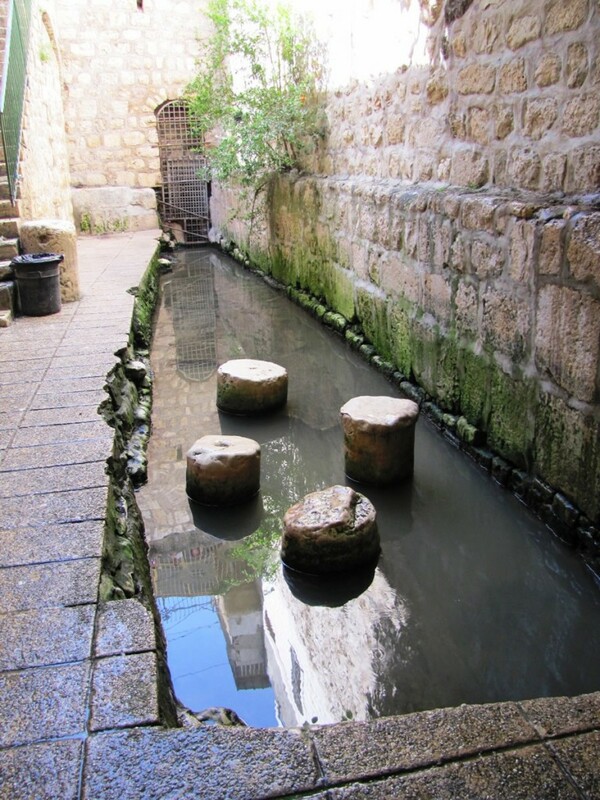 It was not until later that people realized the water in the Pool of Siloam is actually water from the Gihon Springs over a third of a mile away. 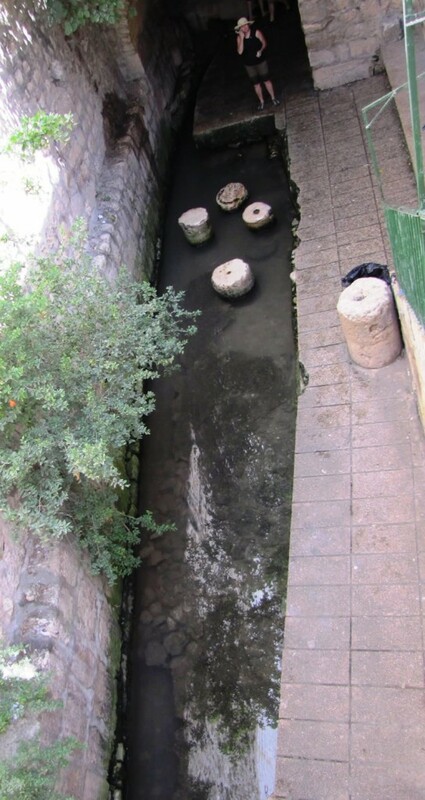 Water still flows naturally from the Gihon Springs today through Hezekiah’s Tunnel and to the Pool of Siloam. 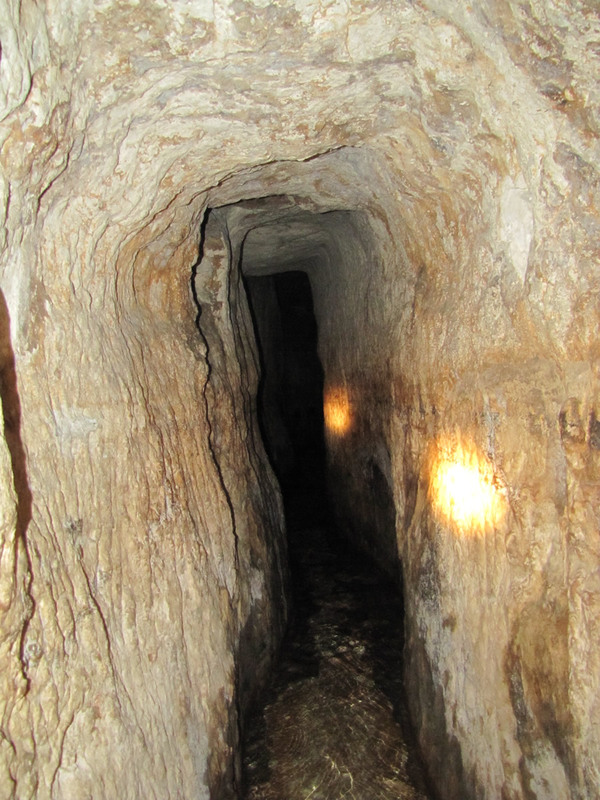 Warren’s Shaft – The water from the Gihon Springs followed a natural tunnel to the base of a shaft discovered by Warren. 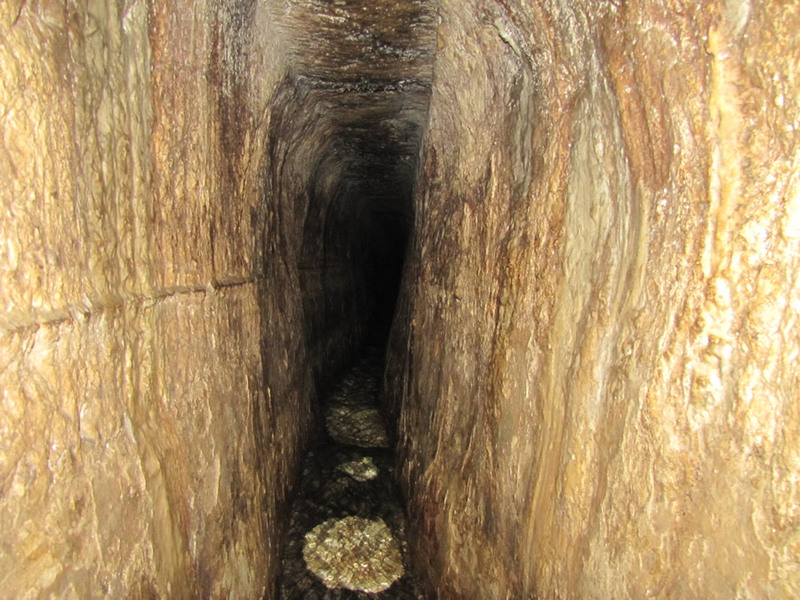 This shaft was developed from a natural sinkhole that extendeded down to the natural tunnel of water from the Gihon Springs. City planners widened the sinkhole and developed a tunnel to reach it from the upper ground level of the city from within the city’s walls. Warren’s Shaft functioned like a well. A person at the top of the shaft in the inclined tunnel could lower a bucket on a rope to the bottom of the 38 foot shaft to get fresh water from the resevoir below. A person could reach this inclined tunnel by entering a vaulted chamber from the ground level, walking down a steep, stepped tunnel, then use a ladder to descend a nine-foot scarp drop to arrive in the inclined tunnel. The entrance to this water system was within the city walls, while the Gihon Spring was outside the walls.